Charlotte Dashiell is a doctoral student of nautical archeology. She is spending her summer working a find in Turkey. Her hope is to find proof of the mythic kingdom, Troy as mentioned in The Iliad. Tragedy strikes shortly after her arrival; the boat she's on is struck by a trawler and the Ministry of Culture representative is killed. A new ministry agent is assigned to the archeological group, Atakan Vadim, and he seems more intent on investigating Charlotte than on his friend and fellow agent's death . . . or so it seems. What follows is a web of international intrigue centered on the smuggling of valuable archeological artifacts and revenge, and Charlotte is the center of the attraction. She is suspect because her stepfather's company donated money to facilitate the archeological expedition and his business partner is a known collector of smuggled art. It doesn't help that Charlotte is the one that turned him to the authorities. As the team of archeologists race to beat the clock and the ravages of nature (underwater earthquakes are gradually destroying the safety of the underwater site), Atakan and Charlotte must also race to figure out which artifact is at risk and who is behind the attempted theft. Golden Chariot is a quasi-action-thriller with hints of romance. Ms. Karlsen has provided characters that have quirks and faults which provide the necessary element of realism. Charlotte and Atakan are likeable characters and humor is brought into the story with their linguistic wrangling, such as explaining the difference between being a coot versus a cootie. What starts off as a working relationship develops into friendship and then much more. 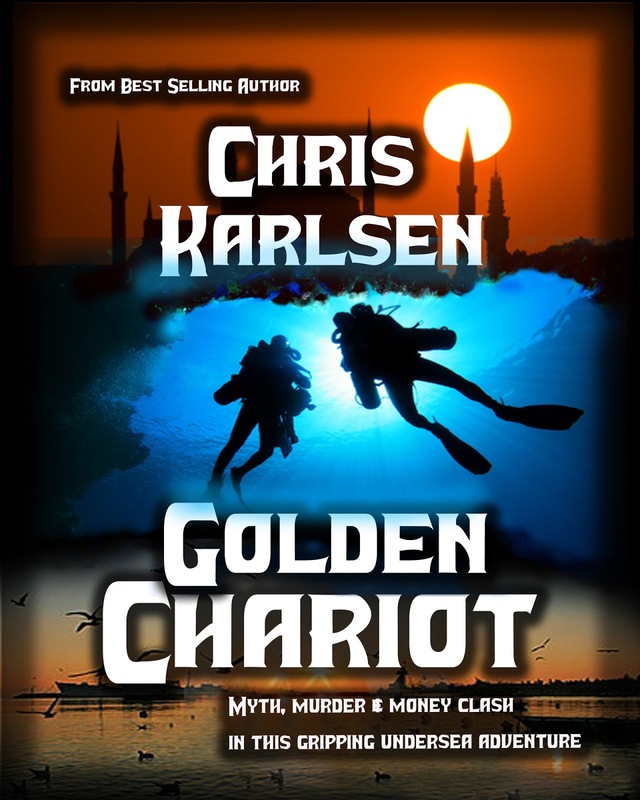 Golden Chariot is a fast read that provides just enough action, romance and international intrigue to make it a unique reading experience. I want to thank Book Diva for taking the time to read and review Golden Chariot. I'm happy you enjoyed the story. A trailer for Golden Chariot will be posted on my website this weekend at: www.chriskarlsen.com. Trailers for my other two books from a different series are currently on the site along with excerpts. I look forward to talking with your followers and hearing their thoughts on books. A big thank you to Book Diva for the lovely write up and review of Golden Chariot. I appreciate the opportunity to showcase my story and to interact with your followers. I look forward to hearing their thoughts and comments.